In 1895 three Victorian philanthropists—Octavia Hill, Sir Robert Hunter, and Canon Hardwicke Rawnsley—had an epoch-making discussion. They noted with alarm that uncontrolled development and industrialization were sweeping away the picturesque British countryside and leaving a ruined landscape in its place. They vowed to do something about this, and together they formed the British National Trust. Their choice of name—National Trust—was visionary in that it foresaw a fundamental collaborative relationship between government and its citizens to protect aspects of the nation's heritage that seemed beyond reach of any specific regulatory authority. An 1858 photograph of Mount Vernon, the home of George Washington, showing its dilapidated condition, and the addition of a side porch and balustrade after Washington's death. In 1860 the Mount Vernon Ladies' Association took possession of the estate to preserve and restore its historic structures and landscape to their 18th-century appearance. The association is the oldest national historic preservation organization in the United States. Photo: Courtesy Mount Vernon Ladies' Association. This initiative, while pioneering, was by no means unique. In 1853 a South Carolina socialite, Louise Dalton Bird Cunningham, stood on the deck of a steamer passing by Mt. Vernon, the estate of George Washington, and was horrified to see its state of dilapidation. When her daughter, Ann Pamela, read a letter from her mother describing Mt. Vernon's sorry condition, she vowed to save it, and she decided to appeal to the women of America for help. In 1860 the Mount Vernon Ladies' Association took possession of the site. The association was the first historic preservation organization in America. Both of these organizations chose property stewardship as a vehicle through which the public could help government manage and protect historic resources. Other organizations, founded around the same time, would choose public advocacy to make their points. In the mid-19th century, the architect and critic William Morris began a public campaign against the destructive "restoration" of medieval buildings being practiced by a number of Victorian architects in Britain. To stop the process, in 1877 he formed the Society for the Protection of Ancient Buildings. At about the same time, John Ruskin, Victor Hugo, and other Romanticists began to lament the loss of Europe's distinguished monuments, many of which were in ruin after a century of social turmoil. This debate—conducted in the drawing room, the academy, and the press—planted the seeds of the concept that the heritage was a universal legacy that should be spared from conflict and turmoil and managed by highly trained specialists. It foresaw the creation of public agencies to handle this task. World Wars I and II tested both the notion that cultural heritage should be protected from pillaging armies and the capacity of governmental agencies to cope with the aftermath. The destruction that occurred during these massive global conflicts gave birth to a new era of norms for wartime conduct in relation to cultural property. The postwar heritage restitution and reconstruction effort following World War II, led by Allied forces and fueled with Marshall Plan funding, can be seen as the first collective international partnership for heritage conservation. Throughout the 1950s and 1960s, UNESCO began to put in place various conventions and charters to regulate the heritage conservation field. At the same time, many influential nonprofit organizations began to spring up with the goal of engaging civil society in the defense of cultural and natural heritage. The World Wildlife Fund was created in 1961 by Sir Julian Huxley, with the blessing of UNESCO and the World Conservation Union, to stop the devastation of nature, especially African wildlife populations. The year 1965 saw the creation of the International Council for Monuments and Sites (ICOMOS), under the auspices of UNESCO, as an expert resource within the field, and the International Fund for Monuments (now the World Monuments Fund, or WMF) as a private-sector global conservation nongovernmental organization (NGO). In the United States in 1966, the National Historic Preservation Act. Funded by government and private contributions, it became one of the field's leading "quangos," or quasi-governmental organizations, operating on behalf of the public. A catastrophe in the same year brought international governments and private-sector organizations together for the benefit of heritage. The flood that struck Venice on the night of November 4, 1966, elicited a worldwide response. Spontaneously, national committees were created around the world, under the banner of UNESCO's coordination, to help Venice restore the dozens of public buildings damaged by the flood. The Italian government passed a special law exempting this work from the value added tax—a unique and critical acknowledgment of the need for resources from all quarters to address this emergency. The Venice appeal set the stage for the ratification of the World Heritage Convention of 1972. This was the first document that not only identiWed the task of preserving heritage as a global concern but also called for international assistance, including participation by private bodies and individuals—a tacit invitation to partnership. Yet the public and private sectors, even if they share a common ethic, have continued largely to follow separate paths, reticent to pool their resources for a common good. Is this because of a mutual fear of losing control, because of a lack of incentive, or because of the perception that benefits gained through partnership may not justify a loss of independence? Or does a lack of formal cross-sectoral cooperation simply result from a lack of experience in this area? To some degree, probably all of these reasons apply. Partnerships, which bring together material and human resources from diverse players—each expecting to achieve a different but complementary goal—can exponentially multiply the means available for a task and the benefits that accrue to the community. To achieve this level of success, however, careful preparation is required. By definition, partnerships involve sharing risks, benefits, and the responsibility for collaborative actions. In principle, the value of the resources each partner brings to the relationship should be equal. But since partners may have different kinds of assets, how can they be evaluated? The success of any partnership is dependent on a clear understanding at the outset of the responsibilities of each partner, the benefits expected from the arrangement, and a shared vision of the results. Who speaks for the collaboration? How is money managed? Who approves plans—and at what stage? Who monitors compliance with standards and expectations? Unless each of these questions can be answered in advance, opportunities for misunderstanding, disappointment, and failure are sizable. If they are addressed in the partnership agreement, the chances of a successful collaboration improve. Partnership does not simply mean securing financing from an outside party. Nor is a partnership the same as a contractual agreement, which obliges the contracting parties to deliver specific services. Partnership involves a shared commitment and a leveraging of capacities beyond what would be possible if each partner were working unilaterally. The larger the vision, the greater the results. For example, heritage conservation work often includes collateral investments in public infrastructure to guarantee the sustainability of the investment in building fabric. Commitments to pave streets and to provide conduits, lighting, and other public amenities may be critical to the future of the building or site that is being preserved. The inclusion of agencies that can provide contextual improvements in a multiparty partnership brings huge leverage to the stewards of heritage sites. The return on an investment in heritage conservation is often argued in terms of local economic stimulus, job creation, and tourism development. Rarely, however, are these expectations quantified as part of a partnership scheme. The vexing lack of documentation measuring performance of heritage sites as economic generators is probably the main reason why few partnerships develop around these shared objectives. Whatever the specifics of a partnership, its success depends upon a real sharing between the partners. A few examples illustrate the importance of this essential element. Jaisalmer, a living walled city in the remote reaches of the Thar Desert of western Rajasthan in India, confronts a challenging future. The entire city—whose building facades are intricately carved from soft golden sandstone—is collapsing because of the introduction of water where, in the past, none was available. Homeowners in the city are unwittingly contributing to the disaster by adding plumbing to their homes in service of a modern standard of living and the city's backpacking tourism business. Water introduced without drainage or sewage conduits is eating away the foundations of the city's historic buildings, leading to collapse. The bastions are pushing outward as the seepage of water produces settlement and lateral movement. If one bastion goes, the toll will be monumental. Views of the 12th-century sandstone walls and palaces of Jaisalmer Fort in Rajasthan, India. Known as the Golden City, this medieval fort complex is collapsing—the result of recent efforts to bring water into the city without adequate drainage. Today, an international cooperative effort, which includes the British nonprofit Jaisalmer in Jeopardy, the World Monuments Fund, and state and national agencies in India, is working to protect Jaisalmer from future erosion. Photos: © World Monuments Fund. Jaisalmer in Jeopardy (JiJ), a foreign NGO founded by the travel writer Sue Carpenter, sounded the alarm. The nomination of Jaisalmer to the World Monuments Watch list in 1996 marked the beginning of a push to overcome the city's anticipated gloomy destiny. Projects began with the restoration of the Queen's Palace as an interpretation center; the emergency stabilization of an active bulge in the wall of the King's Palace (the most important building in the city's center); and a streetscape program, organized by JiJ, to improve urban fabric with historically sympathetic materials and to connect household plumbing to new municipal sewerage facilities. But the challenge remained, with national government agencies and local property owners bickering over who had responsibility in the worst-case scenario. Challenge funding from WMF was the first step toward a more systemic solution. The funding offered, which required a two-to-one match from government, proved to be more than any governmental partner could match unilaterally, forcing a cooperative response. To capture this foreign investment in Jaisalmer's future, the Ministry of Tourism of Rajasthan and the Archaeological Survey of India agreed to share the obligation of local and national financing, but many details remained to be worked out. Eventually a partnership was created for a preliminary, diagnostic, and planning phase of the project to reach consensus on how to protect Jaisalmer's bastions from future erosion, to prepare a group of priority subprojects, and to galvanize civic cooperation and international interest. The National Culture Fund will hold the contributions of all partners, ensuring transparency. The Archaeological Survey is positioned as the orchestrator of the plan, WMF as project manager, and the municipality as convenor. By dividing the burden, the partnership has energized each of the key players to deliver its part and to reach out to a wider constituency of players. Although they are far from solved, the problems are being processed through a framework of cooperative management and mitigated blame. Olana, the Persian-style house built by the prominent Hudson River School artist Frederic Edwin Church, is more than an artist's residence. The property anchors a viewshed that is among the most picturesque in America, and its central position overlooking the river and mountains makes it the crown jewel of one of the country's most significant heritage areas. 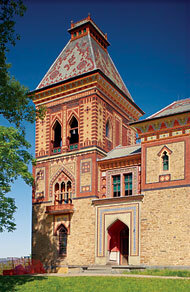 Olana belongs to the State of New York and is operated as a State Historic Site. The property is maintained as it was in the artist's lifetime, but the state has no resources specifically earmarked to support its obligation to the property; both preservation and routine maintenance work are often deferred. State budgets have not been sufficient, either to maintain the estate in optimal condition or to capture its potential as the gateway for cultural tourism in the region. Left: Olana, the Persian-style home of painter Frederic Edwin Church in New York's Hudson River Valley. Right: A craftsman restoring a stenciled cornice, part of the home's exterior restoration. The preservation and enhancement of Olana and its viewshed is a public-private partnership between the State of New York—which owns this State Historic Site—and The Olana Partnership, a private, nonprofit organization. Photos: Andy Wainwright and Rich Gronck, courtesy The Olana Partnership. The Olana Partnership is the nonprofit support arm of the Olana State Historic Site. While the Partnership acknowledges the property's ownership by the State of New York, it brings to the site a dynamic constituency of committed local citizens whose interest in and enthusiasm for the property could not be orchestrated simply through routine cultural resource management. In recent years, The Olana Partnership has raised funds through competitive state and national funding programs and leveraged these with contributions from private benefactors. It has commissioned and is presently orchestrating a preservation plan for the site, and it is supporting restoration work. The Partnership has also conducted planning studies for the construction of a new museum and visitor center to showcase Church, Olana, the Hudson River School of art and other aspects of 19th-century culture. The Olana Partnership supports an active and popular program of events and educational programs at the site, as well as the preservation of the estate. Backed by strong local leadership, The Olana Partnership has also become one of the region's foremost advocates for environmental conservation. A recent controversial proposal by the St. Lawrence Cement Company to build a huge plant only three miles from Olana has prompted strong public debate. The Partnership has taken a stand against the construction and entered legal proceedings together with other local environmental advocacy groups. Independent of political obligations, The Olana Partnership can advocate to preserve the property's pristine values. The state agency responsible for the property—the Office of Parks, Recreation and Historic Preservation—has a specific, limited consulting role with the permitting state and federal agencies and therefore cannot act as an outside advocate for protection of the site. When the U.S. government initiated planning for the invasion of Iraq, nonprofit organizations in the United States began making plans to offer assistance for the postinvasion recovery of cultural sites that might be damaged in the conflict. Reaching out to the Coalition Provisional Authority and UNESCO for information as it became available from the field, the WMF and the Getty Conservation Institute soon realized that the work of conservation organizations offering assistance to the Iraqi government should be coordinated. In March 2004, the GCI and the WMF signed a partnership agreement with the Iraq State Board of Antiquities and Heritage, and in September 2004 they signed an agreement with UNESCO, which will provide the funds for training of and technical assistance for Iraqi heritage specialists. The short-term objective is to provide a system of information management that will allow Iraq to prioritize emergencies as they continue to arise and to direct assistance to where it is most urgently needed. As soon as political conditions permit, the GCI-WMF partnership will also provide resources to support hands-on conservation work at sites that have sustained damage and support planning for conservation of major monuments that are currently unprotected. The GCI-WMF initiative is the first time the two American heritage conservation organizations, which share a global mandate and ethic, have worked together. The partnership brings together two institutions with complementary capacities—the WMF's fieldwork, fund-raising, and advocacy, and the GCI's research work, training expertise, and experience with international field projects. The national electronic database being developed for Iraq is based on a model already deployed in Jordan, which gathers information on the location and current status of sites and is able to analyze threats before catastrophes occur. Training in database development is being conducted with cooperation from the Jordanian Department of Antiquities and the American Center for Oriental Research in Amman, where the Jordanian database was initially developed. The extension of this conceptual framework from Jordan into another environment in the Middle East anticipates future expanded opportunities for partnership, as two countries work from the same information platform. Two examples of archaeological heritage sites under threat in Iraq: Nimrud (top) and Nineveh (bottom), which was looted in the war. The GCI and the World Monuments Fund (WMF) in partnership with the Iraq State Board of Antiquities and Heritage have established the GCI-WMF Iraq Heritage Conservation Initiative to address the catastrophic damage sustained by Iraq's cultural heritage during and in the aftermath of the 2003 war. The protective shelter at Nineveh was reinstalled through an emergency grant made by the initiative. 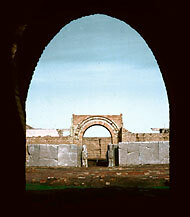 Photos: John M. Russell, courtesy World Monuments Fund. The Getty-WMF partnership envisions a long-term relationship with Iraqi professionals, who urgently need both to reestablish formal training in conservation after the country's long isolation and to devote substantial resources to conservation of monuments and sites. To avoid the confusion and duplication of efforts that would result from competing demands for Iraqi cooperation, the partnership seeks to place international assistance within a coordinated framework. The use of preservation tax incentives, offered by a governmental agency to encourage private investment, provides a final example of a framework through which parties with different but complementary objectives may work together in partnership. Incentives may be offered when other forms of landmark protection, such as designation, are not available. An instance of such a partnership is the saving of the Tree Studios building in downtown Chicago, an artists' residential and studio facility built by the philanthropist Judge Lambert Tree in 1894. 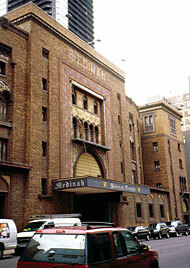 In 2000, the Tree Studios and the adjacent Medinah Temple (one of the nation's finest examples of Middle Eastern-style Shriner architecture) were offered for sale by the Shriners, a fraternal group that had owned the buildings for decades. The high property value of the site—a square block in downtown Chicago—seemed to make it inevitable that the future use of the site would include high-rise construction, destroying the integrity of the turn-of-the-century streetscape. The block is one of the few that has been spared from development through its past nonprofit use. The mayor and the Chicago Planning Commission agreed that the urban qualities that this small area lends to the city should be preserved, and they offered tax incentive funding to finance the commercial development of the buildings in their present form. A partnership was formed between the City of Chicago and a local developer specializing in the reuse of historic buildings. The partnership permitted the developer to buy the buildings with public funds, paying the market price. In return, he had to demonstrate that the tax revenue collected from commercial use of the buildings would pay back the city's investment over a 20- year period. The State Historic Preservation Office joined the partnership, proposing the Tree Studios for National Register listing and monitoring the reuse plans. Tree Studios (top), the oldest-known artist studios in the United States, and the adjacent Medinah Temple (bottom), one of the finest U.S. examples of Middle Eastern-style Shriner temples—both located in downtown Chicago. A partnership between the City of Chicago and a local developer involving public-sector financing of private development enabled the preservation and adaptive reuse of these two landmarks. Photos: Tree Studios, Barton Feist, courtesy World Monuments Fund; Medinah Temple © World Monuments Fund. The Tree Studios will retain their original use as artists' residences, and the building's facade and courtyard will be saved. Shops around the outside of the building will be renovated and offered for rental to high-rent tenants. The Medinah Temple, formerly a theater, will sacrifice its traditional use and become a department store, generating enough tax revenue to preserve the building's exterior, which will be restored to its original configuration. Significant architectural features of the interior will also be saved. A partnership of this nature, involving public-sector financing of private development, depends on a shared commitment between the two parties to the long-term historic urban quality of the city through preservation-minded investment. In the absence of a strong civic voice to advocate for heritage conservation, the municipal government has initiated its own form of public-private partnership. Many nonprofit conservation groups use the mechanism of a watch list to signal the need for broader public exposure to the issues confronting a heritage site. The National Trust of Australia and the National Trust for Historic Preservation in the United States are just two examples of the many heritage bodies that publish endangered lists to galvanize public interest and force open dialogue about the future of a site. Governments often see these listings as a form of censure designed to embarrass the "powers that be" into taking action. This is often not the goal of advocacy groups, which depend on good relations with governmental players. Rather, the listings are an attempt to bring partners to the table together to benefit the common good. The World Monuments Watch list of 100 Most Endangered Sites is published biennially; it lists sites globally and advocates the remedy for an urgent situation that is identified by the site's nominator. In the 10 years since the program was initiated, some 400 sites have been included on the list. As of this writing, the urgent conditions for which each site was listed have been addressed at 65 percent of the sites, with an additional 10 percent making steady progress. Much of this progress was accomplished through unprecedented partnerships, which established common ground between parties that may have previously viewed each other as antagonists. Given the significant resources that these collaborations have unlocked, one is led to conclude that in today's complex society, partnership is hardly a hazard. It may even be a necessity for heritage property owners who have the wisdom to seek to preserve the historic values of their possessions. Bonnie Burnham is president of the World Monuments Fund.